Welcome to the Nonlinear Mechanics Lab at CU-Boulder! Our research interest is in the broad area of nonlinear mechanics of soft materials and flexible structures. We combine experimental testing with theoretical and computational modeling, aiming towards advancing our knowledge in the complex nonlinear behaviors of soft materials and flexible structures. We are also interested in exploring new applications of novel soft material systems. In the past we have worked on a diverse range of research projects in solid mechanics and biomechanics. 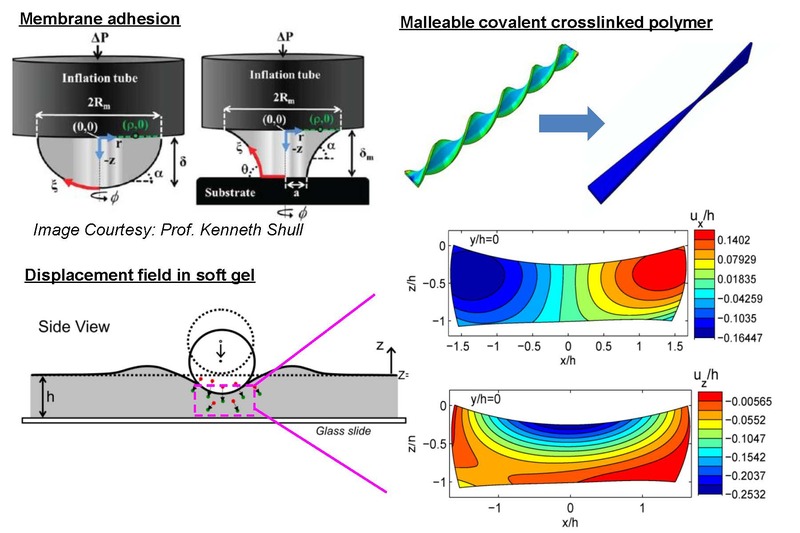 These include fracture mechanics of soft elastomers, continuum mechanics modeling of adaptable polymers with dynamic bonds, characterization of three-dimensional (3D) mechanical tractions of biological cells, adhesive contact mechanics of thin membranes, mechanics of bio-inspired fibrillar adhesives, and adhesion in biological systems. For a list of current research topics, please visit our Research page. Many of our previous projects were completed in collaboration with researchers in other disciplines such as chemical engineering, materials science, and biomedical engineering. We certainly welcome new collaboration opportunities and any talented individuals interested in joining our adventure! 09/09/2018 A new paper by Xiaohao and Luxia in collaboration with Prof.Mark Rentschler and Prof.Hengan Wu is accpted by JMPS! 08/03/2018 A new paper in collaboration with Prof. Franck Vernerey is accpted by Computational Mechanics! 08/01/2018 Rong attended the 2nd Annual Structural Reliability Partnership Workshop held at NIST Boulder Campus and presented a poster on soft material fracture.